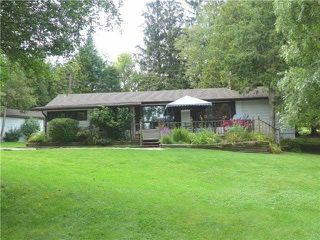 On a dead end road in a small enclave of similar homes, is this charming bungalow on a large lot in beautiful Mulmur. This 3 bedroom home approximately 1100 sq. ft is the perfect place to have either as a weekend retreat from city living, or a full time residence which has been the case for the last 27 years for the current owners. This is one of the nicest lots that surround Springwater Lakes which are comprised of 2 large spring fed ponds teeming with fish which are enjoyed exclusively by the private owners of these homes. On one side is the private sandy beach with an easy walk in area for the younger members and along with picnic table and gazebo, a great place to spend a few hours with the family without leaving home. There are a few docks along with a floating dock, perfect for diving into the water or spending some quiet time fishing. There are extensive groomed walking trails (costs shared by the community) around the 2 ponds and into the forest – no motorized vehicles permitted – to allow a quiet walk with the family pooch or bicycle paths for all. In the winter months, an area is cleared for skating and winter enjoyment. This home is perfect for a couple or young family who is seeking a taste of country living, while being close to the school and town for shopping. Perfect for retirees, it is affordable and amongst neighbours who are there for you if you need them yet respect each other’s privacy. This lot has tall mature trees on all 3 sides of the property and an open clear view of the lake to be enjoyed all year long. There is a detached one car garage with woodshed/storage built onto it and another garden shed for all your tools. The driveway is double wide and can hold up to 8 parked cars.